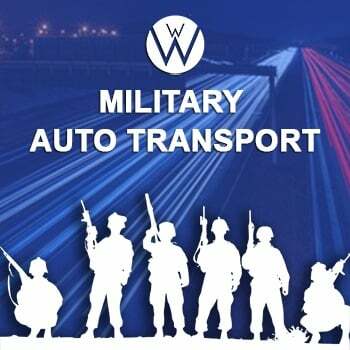 If you are deploying, changing duty stations, or simply have a vehicle that you need transported, We Will Transport It is here to help you with your Military Auto Transport needs. We have the utmost respect and appreciation for our military service members and their families. To show our gratitude to our military, We Will Transport It offers all active duty military and their families the best discounts available for military auto transport. We take a great deal of pride in supporting our troops and consider our military customers a top priority. We thank you for your service and we always offer discounts to any military personal. To show are gratitude for your service and sacrifice; we offer you a military vehicle transport discount of 10% for all active duty service members. Best Military Auto Transport Company in the US. We know that having to relocate from one post to another can be overwhelming. Are you and your family moving across the country or overseas and wondering how you will get your vehicle to your new post? Perhaps you are deploying and need to have your car shipped home while you are gone. Let us alleviate some of your stress. There are over 1,000 U.S. military bases around the world and We Will Transport It can ship your vehicle to or from any base, including those in Hawaii, Alaska, and anywhere internationally. If you have received word that you will be moving or deploying in the near future, we recommend that you make your military auto transport reservation at least one month in advance. As with any vehicle transport, the sooner that you book your reservation, the better your military auto transport experience will be. Booking your reservation last minute lessens your chances of finding a driver and can be more costly. Transporting a vehicle overseas can be stressful, but with years of experience in international shipping, We Will Transport It can get the job done with ease. We have a plethora of reputed companies that specialize in shipping around the globe. Like any transport, the cost will depend almost completely on the size of the vehicle, the distance the vehicle will be traveling, and the equipment that will be required to ship the vehicle. Our staff is armed with all of the resources and knowledge needed to get your vehicle to its destination safely, regardless of how many miles it will be traveling. Don’t forget to mention your military service to our representatives so that you can receive your discounted quote and be added to our VIP customer file. All of us at We Will Transport It would like to thank you for your service and your bravery. It would be our honor and pleasure to transport your vehicle for you. ARE YOU AN AMERICAN SOLDIER LOOKING FOR TRANSPORT YOUR VEHICLE? We Will Transport It is the best Military Auto Transport Company in the U.S.